Charles Auble (1849-1916) was a painter – probably not an artist, but a painter of signs, buildings, furniture, etc. He was a member of the local Painter’s Union. Charles died on 23 March 1916 in his home after falling down stairs and rupturing his gall bladder. The house is no longer there. 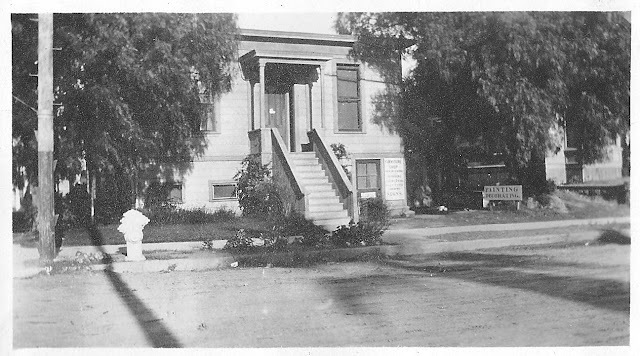 My grandmother, Emily, was a teenager in this house from 1911 to 1916, and attended San Diego High School just six blocks to the north. After her father died, she and her mother moved to apartments nearby and Georgianna went to work to support theirselves. The Charles Auble family came to San Diego in about 1911. The photograph was probably taken in the 1915-1916 time period when the Pentecosts visited the Aubles in San Diego. . Please comment on this post on the website by clicking the URL above and then the “Comments” link at the bottom of each post. Share it on Twitter, Facebook, or Pinterest using the icons below. Or contact me by email at randy.seaver@gmail.com.